Conference proceedings will kick off Wednesday, September 26th with a series of afternoon workshops on Aquatic Plants, Cyanobacteria Identification, and Water Resources Modeling. Please contact Rachael Gravon (Rachael.gravon@kingcounty.gov) to sign up for these workshops, which will be held at Portland State University. Thursday will start with a plenary presentation by Dr. Daniel Schindler from the School of Aquatic and Fishery Sciences at the University of Washington, followed by presentations through mid-day Friday. Topics will include harmful algal blooms; mountain, dryland, and urban lakes; aquatic plants; toxics like lead and mercury; impacts of climate change on lakes; invasive species; and community involvement. 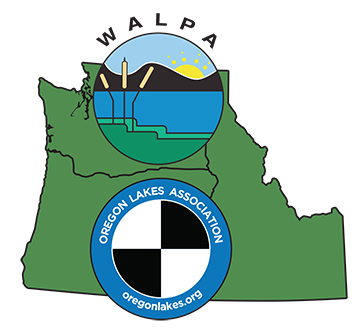 Proceedings will also include a discussion of harmful algal bloom science and management led by a group of experts from Oregon and Washington. Conference activities will conclude with an optional boat tour of Ross Island Lagoon on Friday afternoon. Book your rooms now at the DoubleTree in Portland by calling 503-281-6111 or visit http://doubletree3.hilton.com/en/hotels/oregon/doubletree-by-hilton-hotel-portland-RLLC-DT/index.html. Mention the OLA/WALPA conference to see if discounted rates still apply. Donate to the raffle and auction! Donate cash or items to the raffle and auction held at the conference to support our annual scholarships. These scholarships offer undergraduate and graduate students funds for their research as well as travel to the annual conference to network and share their findings. To contribute to the raffle and auction, or with other general questions about the conference, please contact WALPA President Rachael Gravon (Rachael.gravon@kingcounty.gov ) or Past-President Jim Gawel (jimgawel@uw.edu). Recognize a lakes superhero with a Secchi Award nomination! Each year at the conference we recognize an individual or individuals who have made an outstanding contribution to the practice of lake management, research, and/or protection by bestowing the Secchi Disk Award. Give your limnological superhero a chance to shine and receive the gratitude of the WALPA community! Submit nominations via email by September 15 to rachael.gravon@kingcounty.gov.